Home Research articles Shade Avoidance: Can We Breed for Weed Resistance? Starting in 2015, Rodale Institute began greenhouse studies to determine if crops can be bred to tolerate weeds. These studies will evaluate the potential of weed exposure to induce weed-tolerant crops based on recognition that competition for light plays a key role in plant performance. Performance of the progeny (or offspring) of test plants exposed to the same biotic stress (stress that occurs as a result of damage done to plants by other living organisms such as weeds) is hypothesized to be greater than parental plants. The experiment is designed as a one by three factorial completely randomized block design replicated three times. Oat plants are planted in containers surrounded by annual ryegrass or redroot pigweed, with oat plants or soil as control (Figure 1). Test crop plant seedlings are thinned down to one plant per container. Agronomic data on plant height, number of leaves of each plant, and leaf area measurements are collected from the test plants every week. Weeds are regularly trimmed to limit shade avoidance response to changes in light spectrum rather than actual shading. At plant maturity, crop biomass and grain yield are measured. Seeds from the F2 and F3 progeny of crop plants exposed to two different weed species will be tested for resilience against weeds in comparison with F1 parental generation. Tests will be carried out in the greenhouse and research fields at Rodale Institute and other collaborating Institutions such as the University of Wyoming. The ability of plants to respond to disease-causing pathogens by acquiring systemic resistance when exposed to those pathogens has been widely studied (Casal, 2012; Slaughter et al., 2012). Previous research with Arabidopsis (a member of the mustard family) has established that such acquired defenses can be even more pronounced in the progeny than the parental plant population (Slaughter et al., 2012), similar to vaccinating a parent and seeing immunity in their children (Coombs, 2012). The ability of weeds to similarly induce weed-resistant crop species has not yet been established. It is widely known that plants can sense when other plants are near them, a response referred to as shade avoidance (Holmes and Smith, 1977). Shade avoidance response is attributed to plants’ ability to discern changes in light spectrum within the canopy of a population of plant species growing together. Given that plants absorb red light for photosynthesis, near-infrared part of the light spectrum that is not required for photosynthesis is reflected. Plants detect these changes in light spectrum, such as increased proportion of near-infrared light in reflected light, by triggering shade avoidance response (Slaughter et al., 2012). This avoidance can be viewed as plants’ pre-emptive response to impending resource-dependent competition (Casal, 2012). The response activates physiological mechanisms within the plant that increases its fitness in a competitive environment, such as increased stem elongation, reduced branching, and early seed production (Franklin and Whitelam, 2005). Shade avoidance response, however, can impart an opportunity cost if expressed in a non-competitive environment (Casal, 2012). For example, the productivity of crops expressing shade avoidance responses to weeds earlier in the season may decline even when weeds are removed later after the crops are already “primed” to respond to the competition. This study aims to determine if: 1) these responses are heritable and 2) can make the progeny more tolerant to weeds without compromising their productivity, in a similar manner as systemic acquired resistance response of plants to pathogens. This study is being conducted in partnership with Dr. Andrew Kniss, Associate Professor of Weed Science at the University of Wyoming in Laramie. Dr. Kniss recently shared with us very interesting preliminary results from their experiment. In their study, wheat (they are using wheat instead of oats) was grown in containers either surrounded by grass weed or surrounded by soil in the parental (F1) generation as described above. Wheat seeds from parental (F1) generation were saved and planted in containers surrounded by weeds or soil in such a way that they had all possible combinations of weed/soil environments for 1st generation and 2nd generation (soil then soil; soil then weed; weeds then soil; weeds then weeds). Dr. Kniss collected and analyzed data of the percentage of second generation (F2 or progeny) wheat heads at the beginning of the heading process. 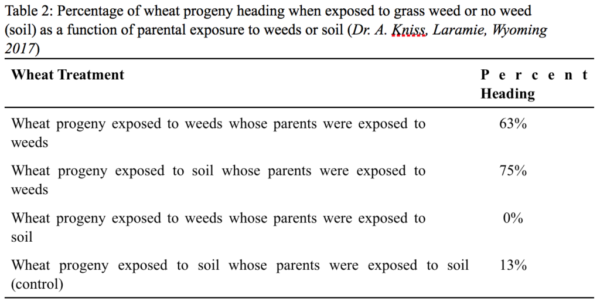 The data showed that there was a 63% and 75% of wheat progeny exposed to weeds or soil respectively whose parents were exposed to weeds (Table 3). 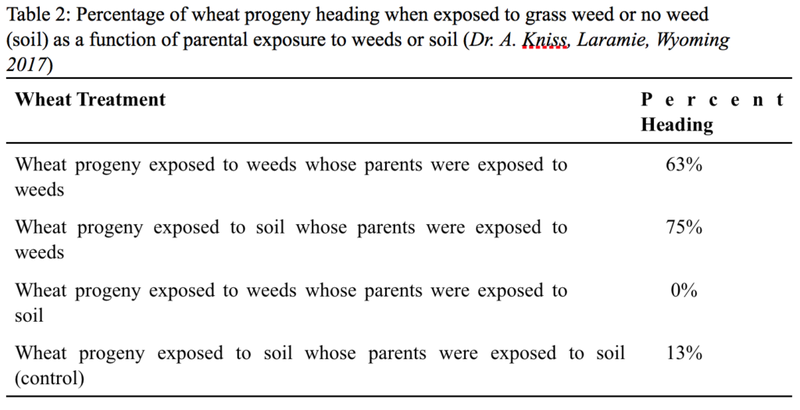 The progeny of wheat whose parents were not exposed to weeds had 0 and 13% heading when exposed to weeds and soil respectively (Table 3). These results strongly suggest that heading date in second generation cash crop (wheat) was significantly influenced by previous generation’s growing environment than current growing environment (Table 2) – the strongest evidence we have shown so far that shade avoidance response to weed exposure is heritable! Due to limited greenhouse space and seed from previous study, our research at Rodale Institute has not yet been expanded to explore all possible combinations of our oat/weed companion treatments. So far progeny generations have been exposed to same environment as parental generations. Preliminary results from these experiments were not statistically significant between treatments. Figure 3: First generation (F1) shade avoidance greenhouse trial showing no difference in mean height, leaf length, leaf width or number of leaves between oats in containers surrounded by annual ryegrass weeds and the controls (oats surrounded by oats and oats surrounded by containers with soil). 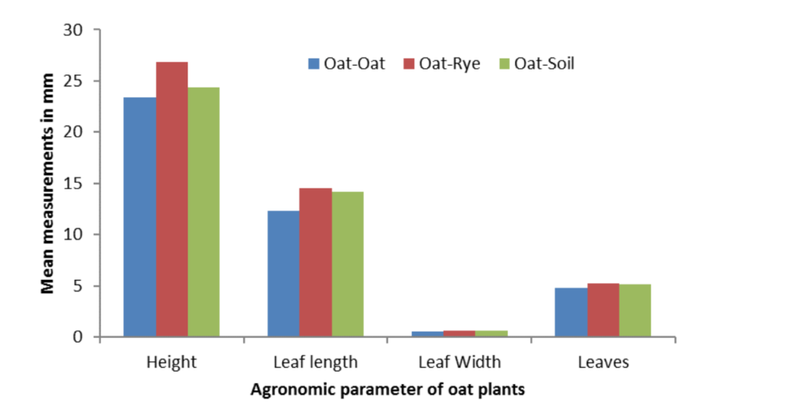 However, results showed a trend indicating that second generation oat plants exposed to annual ryegrass weeds were taller than the controls (oats-oats or oats-soil) (Figure 4). 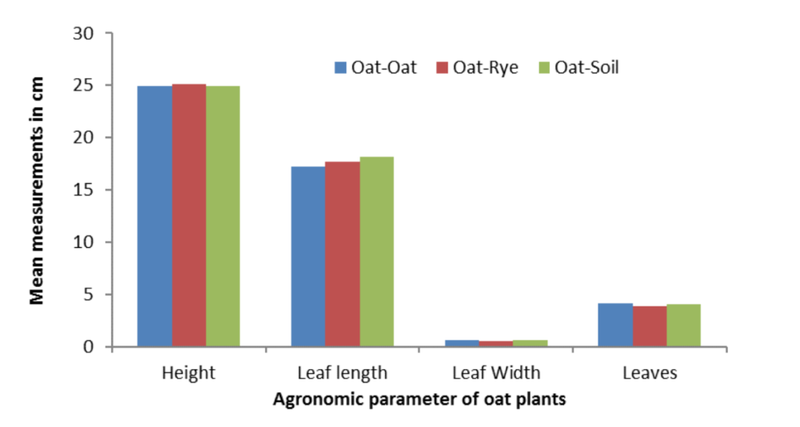 There was no statistical or numerical difference in plant height between the three treatments in first generation oat plants (Figure 3). These results are in conformity with those from Wyoming as they also suggest that progeny generation may have inherited and magnified their shade avoidance response to the presence of weeds. Figure 4: Second generation (F2) shade avoidance greenhouse trial showing numerically greater mean height, leaf length, and number of leaves of oats in containers surrounded by annual ryegrass weeds. With more greenhouse space secured, the next phase of this experiment will involve all possible factorial of oat/weed companion treatments of second and third generation oat seeds. We will then advance to field testing. 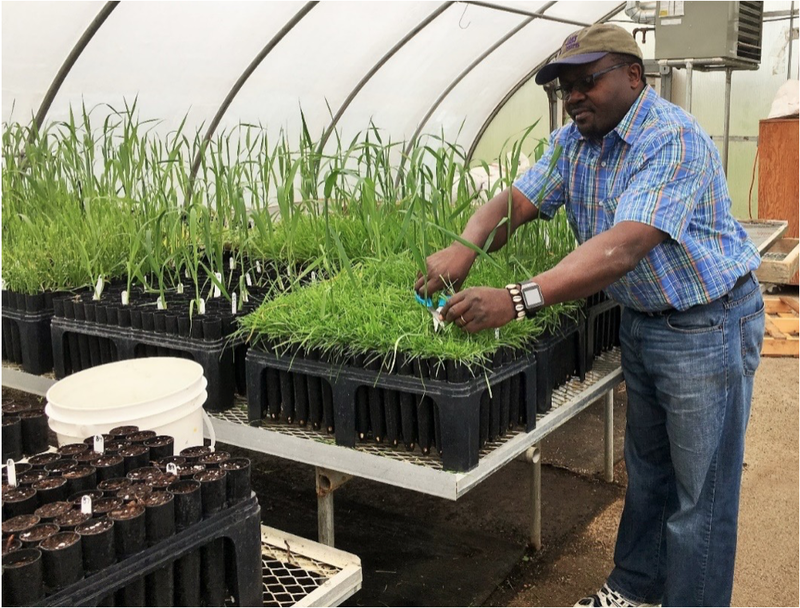 Emmanuel Omondi, Ph.D. is the associate scientist and director of the Farming Systems Trial at Rodale Institute. Casal, J. J. 2012. The Arabidopsis Book,Ed. The American Society of Plant Biologists. Coombs, A. 2012. Seeds inherit memories of enemies. In "The Scientist Magazine"
Franklin, K. A., and G. C. Whitelam. 2005. Phytochromes and shade-avoidance responses in plants. Annals of Botany 96, 169-175. Holmes, M. G., and H. Smith. 1977. The function of phytochrome in the natural environment. II. The influence of vegetation canopies on the spectral energy distribution of natural daylight. Photochemical & Photobiological Sciences 25, 239-245. Slaughter, A., X. Daniel, V. Flors, E. Luna, B. Hohn, and B. Mauch-Mani. 2012. Descendants of primed Arabidopsis exhibit enhanced resistance to biotic stress. Plant Physiology 158, 835-843.